Water residence times in trees of a Neotropical dry forest increase with tree diameter and decrease with wood density during the rainy season. In tropical dry forests, tree species with different drought coping strategies co-exist; leaf deciduous and stem-succulent trees are prominent among them. The actual role of stem succulence in tree water use is not fully understood. In a premontane dry forest of southern Ecuador, five tree species were studied in the rainy season including one stem-succulent species (Ceiba trichistandra). All species were studied at the same site and some also across a soil moisture gradient. Deuterium tracing suggests species-specific mean residence times between 11 and 22 days. Mean residence times for Ceiba and two other deciduous tree species were about twice as high as those of two evergreen tree species. Differences in soil moisture did not significantly affect tree water residence times. 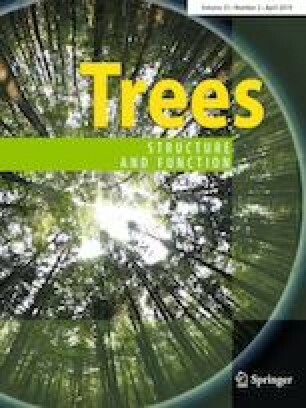 Our and literature data indicate that across species, residence times increase with tree diameter and decrease with wood density. The stem-succulent Ceiba is characterized by a big stem and a low wood density; the observed residence times in the rainy season were situated on the continuum as derived from a larger data set. The succulent stem may, however, play a special role for leaf flushing at the end of the dry season. The online version of this article ( https://doi.org/10.1007/s00468-019-01849-y) contains supplementary material, which is available to authorized users. Sophie Graefe and Dongming Fang contributed equally to the manuscript. The grant of the German Science Foundation (DFG) through PAK823-825 “Platform for Biodiversity and Ecosystem Monitoring and Research in South Ecuador” (GR 4293/2-1, HO 2119/7-1) is gratefully acknowledged. We thank the Ecuadorian Ministry of the Environment (MAE) for the research permission and Nature and Culture International (NCI) for logistic support. We acknowledge valuable discussions with Dirk Hölscher on the manuscript. We also thank Patricio Crespo from the University of Cuenca for providing laboratory space and conducting initial stable isotope analyses.